Techlicious Best of Toy Fair 2018 Turn off the lights! You are deep in a dark, ancient forest with only your lantern to guide you. Tall, looming trees cast shadows all around. Off in the distance you hear a faint rustling sound and your heart begins to race. Could the legend be true? Will you finally discover the creatures who hide in the forest shadows? A Unique Tabletop Adventure Shadows in the Forest is a thrilling, immersive play experience that brings a distinctive twist to game night – you play it in the dark! 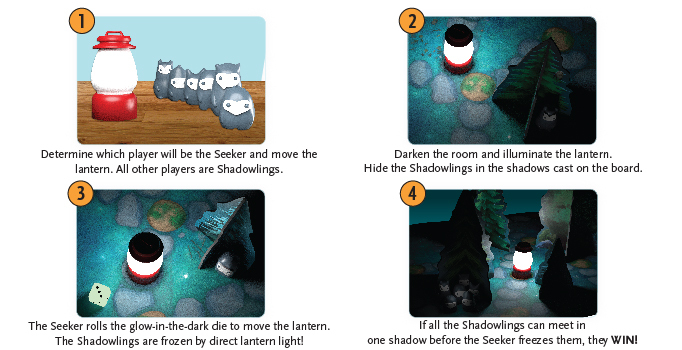 One player moves the LED lantern around in search of Shadowlings, mysterious creatures who avoid the light. The lantern illuminates the forest and trees, casting real shadows on the game board. The rest of the players work together, strategically moving their Shadowlings to stay out of the light.